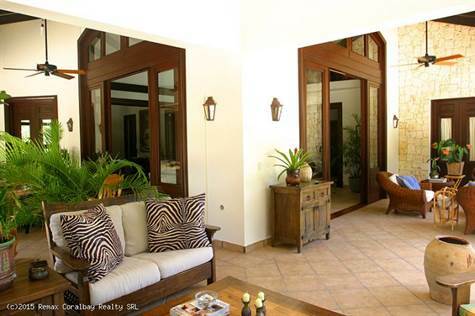 This impressive four bedroom villa beautifully blends Spanish Caribbean hacienda style and Mediterranean touches. The ample living room is well appointed with overstuffed crisp white furnishings and a large dining room off the kitchen provides a more formal place to dine in addition to the terrace. The well designed kitchen features stainless steel Viking appliances, top notch cabinetry stained white and granite tops. The pool area and divinely landscaped backyard is a tropical oasis and the pool gazebo is fabulous to host a poolside party. A master suite is privately located on the second floor and features high end ceramic spa inspired bathrooms with his and her vanities, bathtub and shower. The guest suites are well designed for privacy and have spacious closets and private bathrooms. Air conditioning in each bedroom. All top notch finishing, fine mouldings and European ceramics. Located within an extraordinary gated community, the most distinctive oceanfront villa resort of the North coast of the Dominican Republic offering exclusivity in a setting that is amoung the Caribbean's best. The resort offers amenities such as Equestrian center and Horseback riding, Tennis club, Caribbean Seaside pool and Oceanside Beach Club... Contact us now for more details.